Just as you really start to relax, the gorgeously balanced palate will kick in. Think crisp refreshment with lemon-lime and passionfruit notes dancing around, and a lovely lingering presence. Returning to a mass of fans, this stunning favourite won't stick around forever! 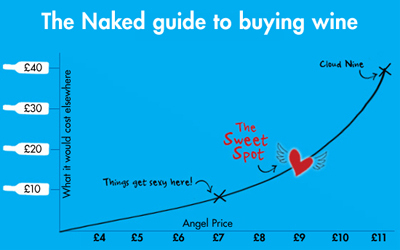 At under $9 for Angels, there is no question it deserves to take up a few spots in your next Naked order! Kym's beloved Riesling is back! hitting all the right notes with Angels last year. Zesty lime, granny smith apples, a hint of pineapple and wet stones will all dance around your mouth. A lovely clean line of natural acidity balances with the purity of the fruit and a mouthwateringly textural mid palate. Juicy and crisp, the bottle will disappear quickly if you have guests! The Ferguson Valley is a picturesque wine region south of Perth. The vineyard is situated high in the hills and surrounded by a stunning national park. The vines were planted in 1999 and have consistently produced high quality Riesling, a natural gift for Kym to work with. Kym has taken every measure possible to ensure the best natural characteristics of the fruit shine through. The harvest was processed chilled to retain flavour, and the final blend consists predominately of free run and a touch of pressings to add texture and smile-inducing flavour with each sip! Sourced from old, nutrient rich vines in the Watervale sub-region of Clare Valley, this Riesling was gently pressed and transformed into a tantalising taste sensation in Adam's workshop. It's clean, fresh and balanced beautifully to ensure each sip leaves your taste buds dancing along to a long lasting flavour party! Every vintage has scored a huge 90% or above buy-again rating from Angels everywhere, proving Adam has worked his magic once again. This gorgeous Riesling comes from our wild child of the West, Paul Nelson. 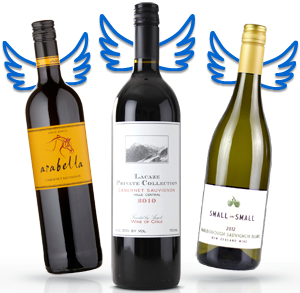 Back by popular Angel demand, you'll taste lively character and Paul's winemaking prowess in every sip! A gorgeous light straw and pale quartz appearance perfectly compliments the aromas of lifted citrus apple and green pear, wrapped with hints of passionfruit and white apple blossom. Paul's Riesling is a light bodied drop with hints of minerality, floral, citrus and spiced pear characters. It's a textual masterpiece with acidity that continues to keep the palate fresh and vibrant. Finishing long with lingering lemon sorbet and lime flavours. Stock up on this delight while you still can.